Beginning a new nostalgic series, remembering the magazines, story books, song booklets and other print material published on Hindi Films Industry in the last 100 years of our cinema, this is the first article of the series recalling the English Magazines talking about Bollywood since 1935. Introducing the genre in print media, FILMINDIA was reportedly the first magazine based on Film Journalism started by Baburao Patel in 1935. It became hugely popular due to its novel concept and bold, acidic reviews which openly criticized films and their Stars in pretty straight words. The magazine got a makeover turning into a social one titled MOTHER INDIA in 1949 and continued to remain the market leader until FILMFARE arrived in 1952. These early decades also witnessed few other publications like PICTURPOST, a pocket book kind of film magazine launched in the early forties from Madras which continued till late 80s and more such as FILM CRITIC, THE INDIAN SCREEN GAZETTE & SOUND which couldn’t survive for long. The 50s saw the emergence of a major magazine FILMFARE in 1952, initiating the Film Awards in the Industry in its next year itself i.e. 1953, which continue till date and are considered to be one of the most reputed Awards of Bollywood. FILMFARE slowly gained its own reputation majorly due to these Film Awards only in the next few decades. In the early 50s, The Indian Express Group also started their own weekly called SCREEN which did not rely on gossip but emphasized on quality journalism right from the start. It was in the form of normal size newspaper with full page posters and center spreads featuring film advertisements and announcements. In the decades of 60s and 70s, Hindi Film Industry was in full swing and projects were becoming major hits every month in the form of Silver and Golden Jubilees. This resulted in many more magazines being introduced in the market which included 3 key names i.e. STAR & STYLE, STARDUST and CINE BLITZ, out of which STAR & STYLE is not currently in circulation. STARDUST came out with a bang and changed the whole pattern of Film Journalism completely as it brought Sensationalism in the front, to increase its market circulation. In fact it was for the first time that a magazine started featuring articles on personal life issues of the actors which found instant readership and publicity in that era. (And references of it can also be found in the films made on those decades like THE DIRTY PICTURE). Trade Magazines also came into existence in this time period which only talked about the Industry news, its announcements and information about its various projects under production. The 70s & 80s saw many new publications coming into the market following the Hit trend but most of them faded away fast too. Many of these magazines majorly relied on Gossips and Scoops, so they couldn’t sustain for long due to the constant demand of more such features every months or week. Such was the power in Film journalism in those days that these magazines collectively BANNED Superstar like AMITABH BACHCHAN and didn’t write about his new movies or interviews at all for a pretty long period. As shown in the picture below, there were so many Film Magazines launched in this period which you might not have even heard of and these included names such as FILM WORD, FILM LIFE, SUPER, SENSATION, FILM MIRROR, YOUTH TIMES and STAR MAG.. Along with the regular film journals, the 80s had few magazines focusing on the “ART MOVIE WAVE” in Hindi Cinema and these were CINEMA INDIA INTERNATIONAL and CINEMA OF INDIA. However it seems that they had a very limited circulation as I myself don’t remember having seen or read even a single issue of them in those years. The mid 80s witnessed another revolution of THE TELEVISION and VIDEO MARKET in India when Doordarshan successfully managed to win over the Indian viewers through its brilliant serials and when VCRs entered the Indian Household as a new means of entertainment. These two factors resulted in a flood of magazines for few years which either talked about Television and Video Market alone or covered a bit of TV, Video and Films all together in their 3 different sections. The key magazines of this era included LEHREN (which also had a Video Magazine released on VHS tapes), TV & VIDEO WORLD and few more. With the last decade of the century (in the 90s) came the CABLE REVOLUTION in the country which once again changed the complete entertainment scenario substantially. Video was fast becoming a thing of the past and in the late nineties Digital Technology was there in the market making way for VCDs, DVDs and other Digital formats to provide us the much needed entertainment in a new way. In this important period of a major transformation in the country, the print media remained a silent witness to many new launches fading away only after few issues from the market and the Film Magazines were not the talk of the town anymore as they once used to be for all cinema freaks. The new millennium introduced many new mediums (or formats) of entertainment all over which in turn (to a huge extent) reduced the passion in people to discuss or talk about films through the medium of Print Magazines. Hard Disks and various saved files on personal computers became the new exchange material and only few magazines could survive this brutal attack of technology advancement on the Print Media. So at present we have only a handful of publications strictly devoted to film journalism and the rest of them talk about all other social issues too along with films to cater a wide range of audience. And among these key survivors are CINE BLITZ, STARDUST, THE FILM STREET JOURNAL, FILMFARE and SCREEN Weekly which are thankfully still there to be our friends with the same good old sweet smell of paper. To be honest, this is one of the most cherished series of articles I have written, taking us back in those memorable passionate days of eating, drinking and sleeping films. And I am sure, all friends here would really love reading it like enjoying an exciting ride in a TIME MACHINE taking us many decades back. So do share the article with all your film buff friends and also please let me know if you have information about any other English Film magazine published in the last century not featured here. With Cheers for The Magazines which kept our passion of Movies & Music alive for so long....! (DISCLAIMER : The pictures of the Magazine Covers featured above are the Copyright of their respective publishers and have been shared here just to fondly remember that Golden Era of Hindi Film Industry with love, without any commercial motive. But still if a respectful owner doesnt wish any cover to be featured here then please send me an e-mail and the picutre of that particular magazine will be taken off at the earliest as desired. 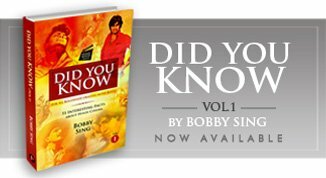 Tags : List of English Film Magazines on Bollywood by Bobby Sing, Magazines published in 100 years of our Hindi Cinema, A Bobbytalkscinema.com Exclusive article by Bobby Sing, Did You Know Facts about Hind Cinema, Bollywood Unknown Trivia, Facts about Hindi Film Magazines. The pleasure is all mine Phalguni as I really love writing about that Loving era when films was the no.1 entertainment source for us for more than a decade. So keep visiting and writing in as there is lot more coming soon in this particular series which would surely take you back in time. Good work done with lots of research. Keep it up!!!! Thanks Daman and there is lots more rare stuff to come....so keep visiting and writing in. sir picture post started in 40s not in 60s as u hv mentioned may be i am confussed and sir THERE ARE FILMLAND (EDITOR WAS B.S .OBERIO)/ THE VARETIES MAGAZINES WHICH STARTED in 1929 onwards till 1935 ,due to competion with BABU ROA PATELS FILMINDIA they WERE NOT ABLE TO COMPETE WITH HIM AS THESE WERE PUBLISHED FROM KOLKATTA AND FOR LIMITED INFORMATION, THEY WERE ABLE TO SATISFY THE MASSES, AND SIR THE 1st FILM MAGAZINE CONTAINING INFORMATION ABOUT INDIAN MOVIE, WAS PUBLISHED FROM KOLKATTA, the name of the magz, WAS BIJOLI. Thanks a lot for pointing out the mistake as after checking again in the few copies I have got, it does say "Established in 1943"....so it now stands corrected as required. However I would be obliged if you can send me the cover photos of the rare vintage magazines your have mentioned as I will surely like to add them all in the article here with your due credits. Looking forward for your valuable contirbution to this article. Do you have the "Lahren" magazine with you which have Amitabh bachchan on cover page ? If YES .. then can you post the scan of respective pages related to HUM ?